Now let's have a look at a real forex chart. Same steps will also apply to downtrend price movement. Leonardo Fibonacci is a founder of a simple series of numbers related to the natural proportions of things in the universe. Fibonacci numbers create ratios that arise from the following number series: 0, 1, 1, 2, 3, 5, 8, 13, 21, 34, 55, 89, 144: Calculated this way: 0+1=1, 1+1=2, 1+2=3 and so forth. The ratio of any number in relevance to the next higher number is 0.618. E.g. 55/89=0.618. There is no need to perform calculation each time you get into a trade, your trading platform is going to do it for you. 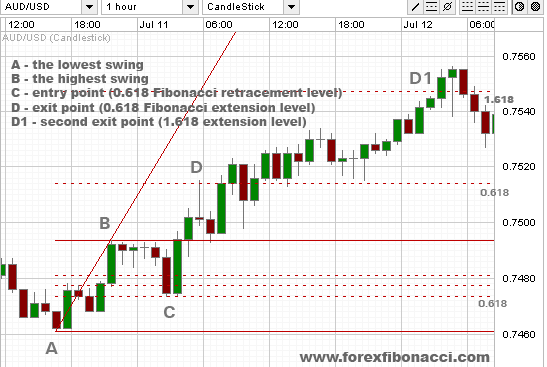 Learn more about Fibonacci strategies in Fibonacci Book — Free Forex eBook.